RSP Nutrition Joint Support Review | Does It Work? RSP Nutrition Joint Support Review – Is This Product Safe To Use? This product can be bought over the counter without a prescription. It is available for an average of $24.99 for the 180 capsule bottle depending on the store you buy it from. This price however may change depending on the store and the shipping and handling costs. RSP Nutrition Joint Support is a dietary supplement that is touted to be made using some of the world’s most sought after joint care ingredients. The producers claim that they hand pick all the ingredients that go into this product to ensure that only the highest quality ingredients end up in your capsule. This product is manufactured by RSP Nutrition, a nutritional supplements maker that is known for producing supplements for body builders. Majority of the product they produce are meant for bodybuilders and other athletes. RSP Nutrition Joint Support was initially targeting the same market but it can be used merely for joint support. Glucosamine – This is perhaps one of the most sought after joint care supplement. It is harvested mainly from the cartilage of shell fish. It has been proven to promote cartilage regeneration and to some extent inhibit the production of inflammation causing agents. MSM – This is our body’s source of natural sulphur. Sulphur is critical in joint care in that it is actively involved in the formation of keratin. Keratin is an important component of the support structure. How RSP Nutrition Joint Support works? 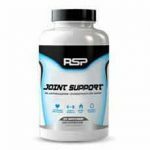 RSP Nutrition Joint Support is a long term joint care product that is designed to support our body’s inbuilt mechanism to restore damaged cartilage and inhibit the formation of inflammation agents that harm our joints. Inflammation has been single out as the leading cause of joint pain in humans. By containing inflammation, any product is able to keep joint pain in check. The producers advise users of this product to use it for at least four weeks for optimal results. The recommended dosage is three capsules daily. The manufacturer recommends taking this product on an empty stomach. RSP Nutrition Joint Support is made using natural ingredients that have been proven safe to use. By the time of writing this review, there were no known side effects of using this product. At the same time,, it is highly recommended that you avoid taking this supplement if you are pregnant, breastfeeding or allergic to any of the ingredients used in this product. Is RSP Nutrition Joint Support a scam? RSP Nutrition Joint Support is not a scam. It is made by a reputable company that has been in the supplement business for quit sometime. At the same time,, it might not work as advertised. Allow up to five weeks for the beneficial effects to be realized. RSP Nutrition Joint Support is a strong product based on the list of ingredients used. However. The product lacks reviews and this is not ideal. At the same time, we have reviewed other products that are better that RSP Nutrition Joint Support.